This recipe puts a fun twist on saltimbocca, a classic Italian dish traditionally made with veal. Carve and plate the hens over a bed of greens for a presentation that looks as good as it tastes. Pat hens dry. Using sharp kitchen shears, cut along both sides of the backbone to remove it, then clip off wing tips; discard backbone and tips. Fold hens open so insides are facing upwards, then cut each in half along the breast bone with shears or a sharp chef’s knife. Combine softened butter and minced sage. Using your fingers, loosen the skin from the meat of each hen half and stuff 1 Tbsp. butter mixture under the skin. Lightly oil hen halves and season with salt and pepper. Sear hen halves, skin side down, in a large sauté pan over medium-high heat until skin is browned and crisp, about 5 minutes. Flip hens, then place the pan in the oven. Roast hens, uncovered, until breast meat reaches an internal temperature of 160°, 15–20 minutes. Remove pan from oven, using a towel or oven mitt to grab handle. Set hen halves aside on a platter to rest, uncovered, for 5 minutes. Drain oil from pan. Sauté prosciutto, in the same pan used to cook the hens, over medium-high heat until crisp, about 3 minutes. Add garlic and sauté 1 minute. Deglaze pan with wine; simmer until liquid is reduced by half, about 5 minutes. Add broth and sage leaves; simmer 3 minutes. Off heat, whisk cold butter slices into sauce until completely emulsified. Whisk together oil, vinegar, shallot, Dijon, sugar, salt, and pepper for the arugula salad. Toss with arugula. 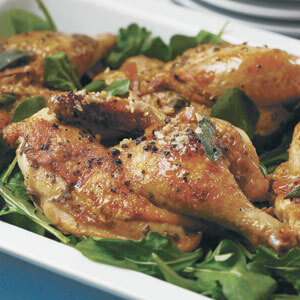 Serve hen halves with salad; top with sauce. Use sharp kitchen shears to remove the backbone — it’s much easier than cutting with a knife. Before stuffing the birds under the skin with butter, use your fingers to loosen the skin from the meat. When flipping the hen halves, get the tongs completely under each half before attempting to lift. It helps prevent sticking. Use wine to deglaze the pan, scraping the bottom with a wooden spoon to release any browned bits. This adds flavor to the sauce.